Our second crowdfunding campaign has reached its final stage. By providing you with the latest information on the solid development of Foodist, we would like to ask you again to invest in Foodist. By hiring Christoph Bednarz, Foodist has now made its favorite candidate its new CFO. The fact that Foodist has hired Christoph underlines the company's ambition of becoming the market leader for handmade delicacies in Europe. Christoph contributes a total of more than four years of experience gained in important positions in growing e-commerce businesses to Foodist. An international controller at Groupon, he took a leading role in financing rounds and in the NASDAQ IPO of Groupon. Because of his work as an investment controller at Rocket Internet, Christoph also possesses an in-depth knowledge of the investors' perspective and an impressive network of investors. Moreover, Christoph's previous position as the global head of finance at HelloFresh provided him with important experience of internationalization processes in the online grocery industry. HelloFresh is a leading seller of cooking boxes in 6 countries and is owned by shareholders such as AB Kinnevik (an investment bank), Holtzbrinck Ventures (a German venture capital company), and Insight Venture Partners (a New York-based venture capital company). In total, HelloFresh has capital resources of EUR 70m. As Foodist grows as a company, demands on the department of controlling are increasing. 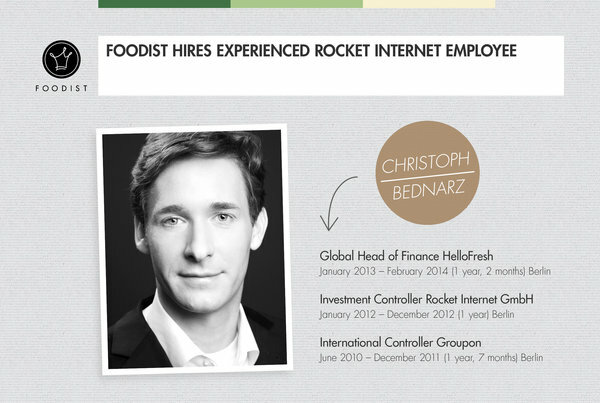 At Foodist, Christoph will be responsible for both financial controlling and online marketing controlling. In addition to that, we trust his skills concerning the monitoring of margins and the optimization of the stock within our business unit Foodist Handel (Foodist wholesale) in particular. The response to our wholesale products has been overwhelming. Apart from the KaDeWe (Berlin's most famous department store) and Frischeparadies (a chain of delicacy stores) in Germany, two major delicacy chains from Austria and Switzerland have become very interested in our product range. After the first few weeks, it has also become clear to us that we fulfill the requirements of both individual gourmet shops and major players concerning the expected margins and the terms of delivery. In so doing, we have even achieved higher margins than we expected. Currently, we are successively visiting individual cities. Having been to Hamburg and Berlin last week, we will continue our sales tour in Cologne and Düsseldorf this week. Afterward, we will go to Stuttgart and Munich. We are grateful for any tips on suitable shops in specific cities. We are in intense negotiations with Grissemann, one of the largest markets in Austria, where we want to test a multi-channel strategy. For this strategy, we will create a website based on the Grissemann design on which over 50,000 customers will be able to purchase a Foodist subscription. Grissemann will receive a commission for every Foodist subscription sold via the website. All products from the Foodist box may be reordered in our online shop, in the Grissemann online shop, or offline in the Grissemann market. The market has a total sales area of 11,000 square meters and generates EUR 59m in revenue each year. With more than 110,000 visitors in total, Eat & Style is one of the leading consumer fairs in the areas of gastronomy and gourmet food in Germany. 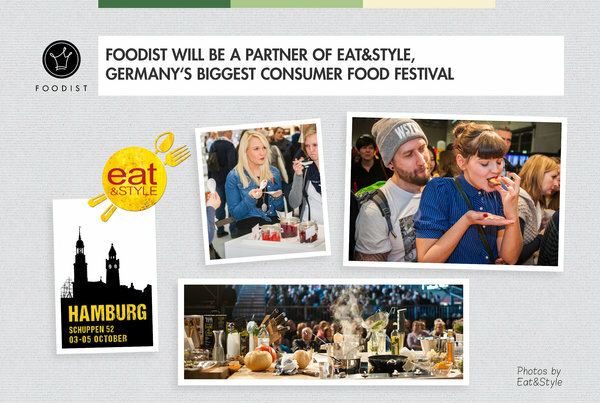 An expert on delicacies, Foodist will be a partner of the next Eat & Style in Hamburg (from 3 to 5 October) and present the latest gourmet trends. Numerous producers are very interested in being recommended by Foodist. Thus, all producers we select will sponsor the products for our exhibition stand. In addition, we will get a special rate for our stand from Eat & Style. We are looking forward to a great last day of the campaign together with you! Please register in order to see the complete profile of Foodist 2.